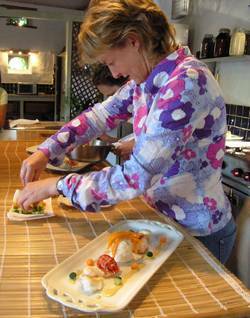 The Walnut Grove Cooking School offers five day hands-on cookery courses in the northern Loire Valley region of France. 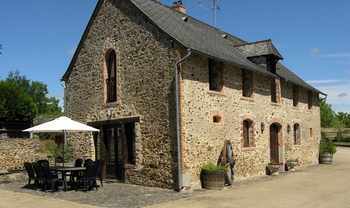 Just one hour and 40 minutes by TGV from Paris, the school includes a charming four bedroom farmhouse with en-suite sleeping accommodations for guests. Just across the courtyard is the airy kitchen where lessons are held. This dreamy location offers a tranquil slice of rural France far from the crowds of tourists. The classes are taught in English by two professional chefs: Maynard Harvey and Benedict Haines . Maynard and his wife Freya ran an award winning restaurant in Wales for four years before moving to France in 2000 with their young family. Both Maynard and Benedict have enjoyed illustrious careers in five star hotels and country houses in England. Each class has no more than eight clients so everyone has maximum personal attention. Because each class is small enough to cater to their needs, it does not matter what skill level people are at. The style of food is modern gourmet cuisine. The emphasis at the Walnut Grove cooking school is "to make gourmet cooking easy and accessible to everyone." The course begins on Saturday afternoon with an introductory talk about the week ahead. Champagne is followed by a six-course gourmet dinner, which gives everyone an idea of what they will learn to cook! Sunday is a full day in the kitchen running through some basics: knife skills, seasoning, stocks and sauces, butchery, fish filleting, and bread making. These skills will be expanded on throughout the week, during which the group splits into two teams. Each team is accompanied by one of the chefs. Working on the evening meal, one team will do one starter and the main course, and the other team will do another starter and the dessert. As a group they also learn to make pasta and various pastry skills - chocolate piping, sugar work (caramel cages, etc.) and manipulating tuile mixture into a variety of shapes. There is a strong emphasis on presentation and pre-preparation which can help not just home cooks but also semi-professional cooks. Each day the teams change and people discuss what they have learnt over the evening meal. There are also visits to local culinary landmarks. One is to a 19th century windmill still milling buckwheat flour in the traditional way. Another is to a local farm where Madame Bois demonstrates how she makes her butter, crème fraîche, cheese and fromage frais - tasting is included! The courses are run through the spring and the autumn. 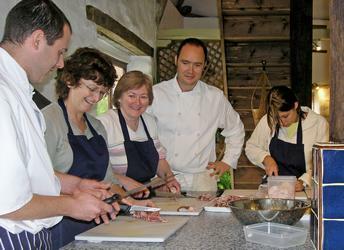 You can find the dates on the Walnut Grove Cooking School website under booking and price information. To find out more about the Walnut Grove and see their full itinerary, photos and testimonials visit their website: Walnut Grove Cookery. Return to French cooking schools and classes.